Thank you to the DCLT staff at Adwick, Edlington, Dearne Valley, Thorne and Rossington Leisure Centres, plus Minsthorpe Leisure Centre. As one of the most successful swimmers ever to represent DARTES we felt Greg deserved a page of his own. A National Finalist in every stroke (inc. IM) bar Breaststroke, and covering the whole range of distances on the program (100, 200, 400, and 1500), Greg was a key member of the team which took the early 1990s by storm. Above: Greg swimming Butterfly at which he was National Champion (100m) in 1991. 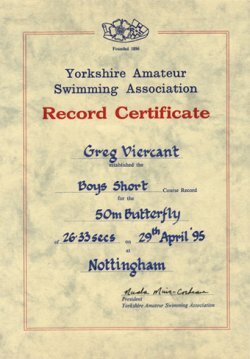 In 1995 he also claimed the Boys Short Course Yorkshire and North Eastern Counties record at 50m. 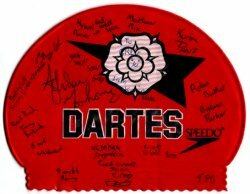 A Get Well Soon DARTES cap autographed by some of the team (and Adrian Moorhouse). Thanks to Greg for the photo and other memorabilia on this page.